Many times when we think of a different world or different species of beings we look to the sky picturing faraway places among the stars. 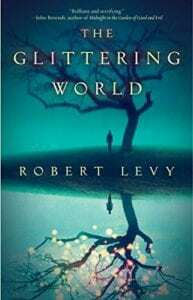 However, in Robert Levy’s book, The Glittering World, a species known as the “fae” dwell under the ground deep below the depths of the land. Some people in the land of Novia Scotia believe that these are evil beings that only mean harm while others see them as amazing creatures that could hold the cure to many ailments that plague the human race. It is exceedingly rare to catch a glimpse of the fae and even more rare to see their homes for the entrances are constantly changing never to be in the same place twice. It is not until four people travel to this seemingly magical place that the world of the fae is truly seen. When Blue Whitley learns that his grandmother left him her house after her death he comes to the conclusion that it will be best to see the house and then quickly sell it. This will pay some crucial debts that continue to haunt him back in New York City. Seeing this trip as a time for a little rest and relaxation, Blue invites three people to accompany him - his best friend Elisa, her husband Jason, and also another friend and employee of Blue’s named Gabe. However, it soon becomes clear that this trip will not be in any way a vacation, as Blue quickly feels a pull to this land that may not let him return to New York at all. For all his life Blue’s mother would never tell him much about where he was born and the family he came from but the woods around Novia Scotia seem to be calling him home, his real home. Suddenly flashes of his childhood start coming back and he begins to wonder if he is actually meant to be a part of this world or one that lives below the ground. After reading the synopsis of this book it did sound like an entertaining and interesting story but unfortunately as I continued reading I never really hit a point where I truly enjoyed this novel. I am not denying that this storyline was quite unique and original but there was not a point where I felt I understood the direction of this book. For me I enjoy having a clear picture of who the hero is and who I should be rooting for as I dive deeper into a story, and I never had that moment. This book is written from the perspective of four different characters and while I was able to learn different attributes of each character, I never felt that I could say which person was the actual main character of this novel. There was no one to cheer for, and not an evil to fight against or overcome and for me, those are factors that make a book a great read. Quill says: A unique novel but unfortunately a very confusing and unsatisfying storyline.